It would be a challenge and take some skill to put H.P. 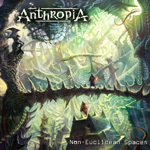 Lovecraft's abstract and arcane literature to music, but French progressive metal band Anthropia has given it a shot. Have you ever tried to read Lovecraft? His writing is so totally verbose, a verbal exaggeration put to paper. I've tried reading Lovecraft, just don't have patience. But Anthropia's music may give cause to make another attempt. Basically, the band is exploring the Cthulhu Mythos that pervades much of Lovecraft's writing. This mythos has fascinated additional writers and artists over the last century, and Lovecraft has been considered one of the progenitor's arcane horror and suspense, but also sword and sorcery fiction. Anthropia's pivot point is Lovecraft's character Randolph Carter, a rather ubiquitous fellow who surfaces in many stories with more than a little autobiographical references to the author himself. But enough of Lovecraft. How do you put his eccentric writings to music? 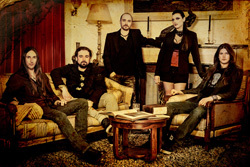 You put it in the capable hands of Anthropia founder, guitarist, and composer Hugues Lefebvre and let him create some creative and entertaining progressive power metal. I mean this premium material, and there's a lot of it, better than an hour. The arrangements are large with an abundance of depth in their movements. Woven together are the threads of immense and harmonious riffage, acoustic melodies from guitar and piano, twinkling and sometimes symphonic synths, big drums grooving in the background, and bright to ethereal female vocals. All the while, the compositions remain the platform for Lefebvre's impressive guitar wizardry. The songs are not so much technical wonkery meant to be impressive or to overwhelm, though they can do both, as they are songs that draw you in, compel you to take interest, and keep you listening. And they do keep your interest. Though I can say that it seemed like a long journey, and the album could have been trimmed, my interest stayed constant throughout. Silver Twilight Lodge and When The Stars Come Right, by example, move with twists and turns that slide between planned intrigue and nearly reckless abandon. Then there's the cover of French composer Roland Dyens's Fuoco, where Lefebvre twists his classical guitar with the briskness of heavy power metal. Perhaps more could be said of individual songs, but these generalities combined with the videos below should kindle your interest to explore Non-Euclidean Spaces. You won't be disappointed. Recommended. Hugues Lefebvre and Anthropia put their progressive power metal wizardry to work with the writings of H.P. Lovecraft with some ambitious and entertaining results.